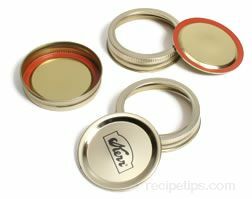 A utensil used for the canning of foods when working with glass jars. As the jars for canning are sterilized in a hot water bath or as they are pressure cooked with water converted to steam, the sealed jars become very hot and require a device to remove them from the cooker. 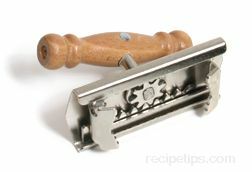 A typical jar lifter made of stainless steel has the appearance of large tongs and is uniquely designed to accomplish multiple tasks with jars that are extremely hot. The handles of the jar lifter are coated with a heat resistant plastic to keep hands safely away from the metal if the lifter should absorb excessive amounts of heat. 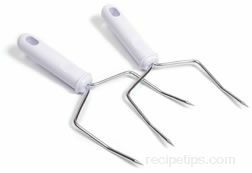 The shape of the lifter is formed so that the tongs fit securely around the mouth of the jar if it is upright for cooking or sterilizing as well as around the body of the jar if it is lying horizontally. Similarly, the tongs can fit inside the jar mouth or around the body if the jars are lying down to be sterilized in a hot water bath. Jar lifters are well suited for canning and are well designed for the needs of anyone canning foods at home.